Long Rider Ed Anderson is planning to complete his journey up the Pacific Coast Trail. 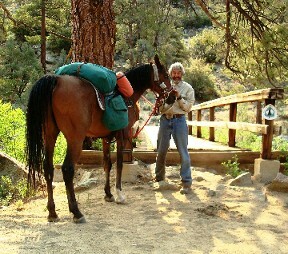 Long rider Ed Anderson, now 73, solo riding his Arabian horse Primo, will journey north to Canada on the Pacific Crest Trail beginning early July 2009. In 2008 he rode from the border of Mexico to Sisters, Oregon. This year he will first ride the 230 miles from Sierra City, California to Burney Falls, California. This section of trail was closed in 2008 due to lighting-started wildfires. Then Ed and Primo will restart from where they left off in Sisters, Oregon and continue north through Washington along the Cascade Range to Canada. If all goes well, Ed expects to reach Canada during mid-September. 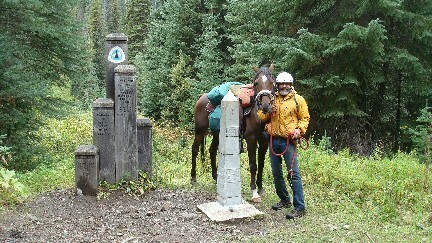 On 9-9-09 we reached Monument 78, located at the northern terminus of the Pacific Crest National Scenic Trail to complete their journey from the Mexican border to the border of Canada. The attached picture was taken by a thru-hiker from Finland who arrived just minutes after we did.